while other hypothesize that the poles are shifting. I’d like to assert the direct link of a broken hydrological cycle representing a tangible part of climate change. Most importantly this is one undeniable facet that we all can impact positively. Alternatively we can forget about our role and blame but not take responsibility for ecosystem degradation. If you don’t own the land you live on, lobby the owners to allow water harvesting to occur. If that is not possible, lobby the local government to create regulations that require it. Or even demand businesses to budget for and install water harvesting as to improve water quality and restore vitality to the ecosystem that surrounds. If you are a landowner, ask how to make your landscape more resilient, more of an infiltrator and sponge of precipitation? 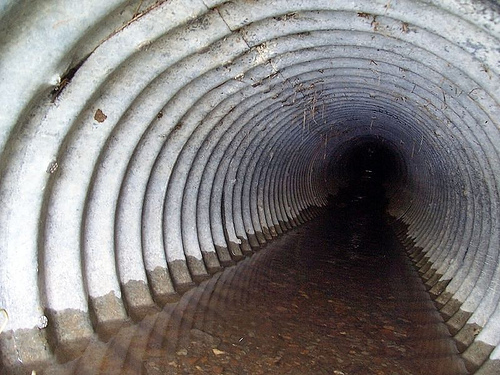 Is water running off into sewage pipes and local streams when it shouldn’t be? 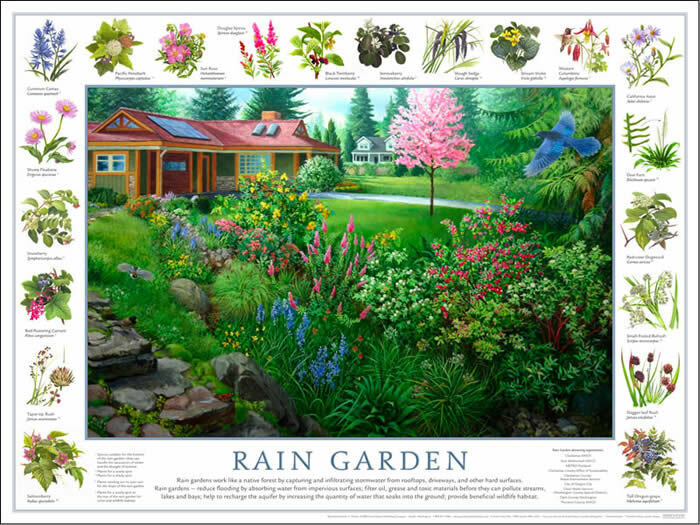 Are we watering our landscape incessantly? Our lackadaisical approach of grid tie-in comes with huge energy inputs and it should be a primary goal of alleviating this dependence. Being a big fan of math, I hope the following astounding calculations reiterate the need for a more holistic perspective on development. The contexts are set on commercial/industrial areas as well as industrial agriculture in the state of Iowa. So what does happen when a Wal-Mart (or any big box store) is built or a state decides to become the epicenter of corn and soy? 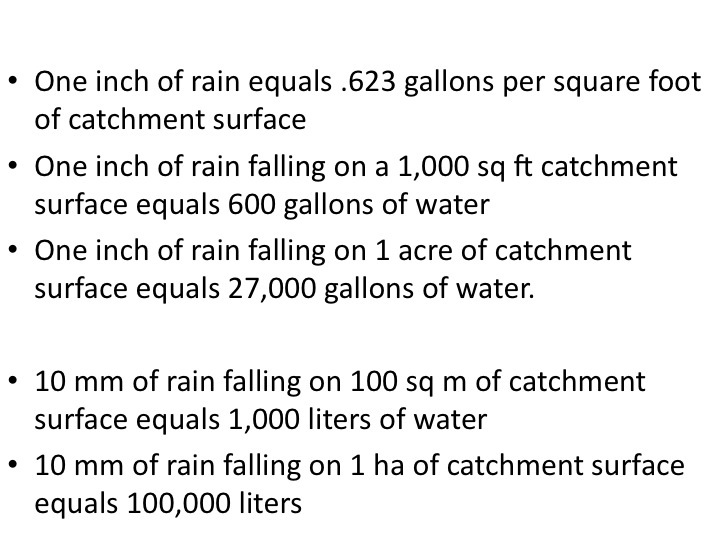 Well first, let’s have a quick glance at a cheat sheet from Brad Lancaster’s Book Rainwater Harvesting to quickly see how rainfall totals on a broadacre accumulate quickly. 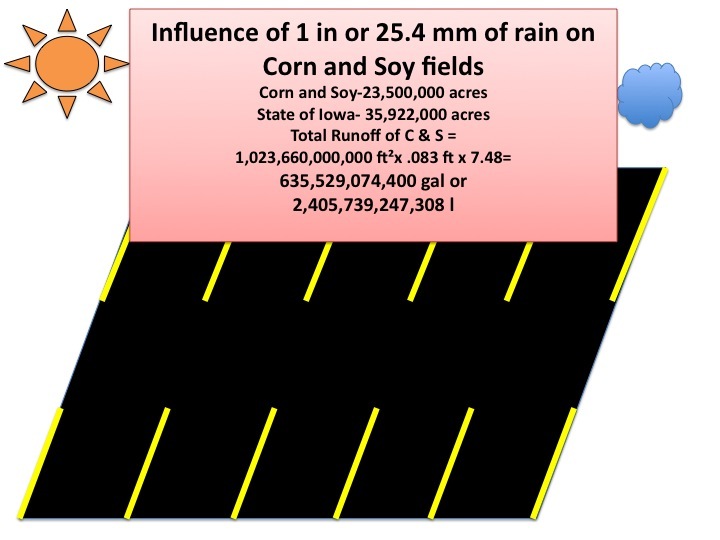 This will help us quantify parking lots runoff, be that concrete or the analogous corn and soy field with how the soil is treated. Our societies insistence on growth for the sake of growth has come at the price of the hydrological cycle and local ecosystems. We shunned water instead of seeing it as a gift as our cartesian, rational model keeps digging the hole deeper so to speak. A hole that is becoming epic in proportions as the cascade through society is enormous. So what happens to local water ways when huge areas are put under the oppression of concrete and large storm pipes? 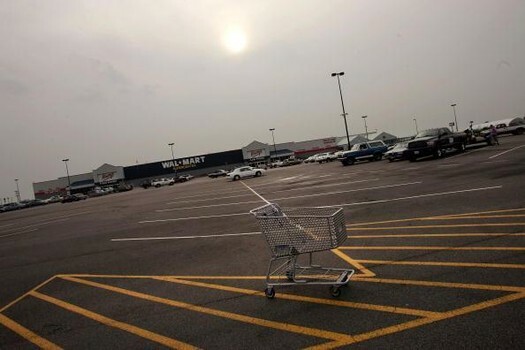 Damage, degradation, financial cost, all leading to an energy drain of an ecosystem… To illustrate the point I have examined a nearby Wal-Mart development (ecosystem) to my residence in the states. It uses scale to create squares which are an acre or half-acre in size. I have made calculations based on 17 acres as my original researched showed this was an average size. This number has changed over years and the figure below reveals 22 acres were altered for the BigBox development. The numbers below will simply make your jaw drop from an even smaller acreage based on an average!!!!! negligence of the company to develop holistically through failure of budget and design. Having grown up on the uphill banks of a local creek, I have seen the effect of firsthand on the people who owned the houses on the downhill side that would constantly flood. It decreased property value and was a drain on the community itself. So why did the floods continue to happen year after year despite the local council throwing lots of money into stream augmentation? Why was it ok to build the houses there in the 50’s but in the 80’s and 90’s they were constantly inundated? These numbers below are quite revealing with just one inch of rain or 25 mm which is a very average rainfall event. running off. So while local councils approve these projects wildly for tax money from their sales, what they fail to understand is that tax money is dumped into stream augmentation, street repair, and insurance payouts due to system failure. Overall, it’s a cascading drain but because politics and economics are not viewed holistically, how can we point to unproductivity of workers in City Hall to a development in the suburbs? Because water quality was degraded in a local stream which is upstream of where we take our drinking water out. 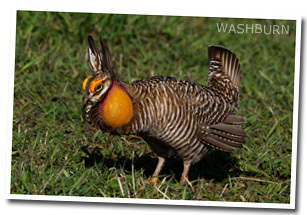 the prairie chicken one of the animals harmed in the erasing of habitat for corn and soy production. Meanwhile, 100 year floods seem to be more and more commonplace causing unbelievable human trauma and financial despair! The state of Iowa, where I have taught PDC’s before at the University level, is a perfect example of the problematic floods. Why? Because the prairie was plowed under, the savannah savagely destroyed, and the forests felled. The natives who lived there faced genocide while the buffalo were eradicated for sport and replaced by non-native cows and sheep. Below the calculations demonstrate on a bigger scale that when soils and ecosystems are altered, their inability to receive water efficiently causes huge pulsations of water inducing the flood and drought syndrome. 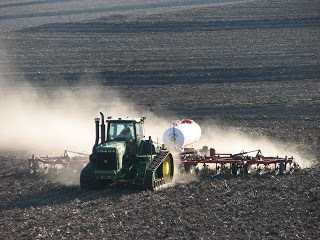 Soils in the midwest of the states are fertilized with a Nitrogen input known as Anhydrous Ammonium. It is very common to see the half million dollar, enormous tractor driving around and pulling a propane looking tank in the spring (allergies anyone?). They spray this caustic material out rendering the soil life virtually dead except of course a few pathogens that can tolerate the anaerobic conditions that are being favored. This chemical was used widely in the Vietnam War because of its capability to knock out the humus in soil and create emergency runways. Jungles always have a couple of inches of humus which is not easy to land a plane on with its slippery texture. So they would spray Anhydrous Ammonium to create a concrete like substance for the war machine. This is also true today because of the weight of the tractors that are utilized in industrial, chemical agriculture. They need a concrete like surface to drive on and prefer this attempt at sterility and dependence on chemistry rather than stimulating biological driven systems. This obviously has a detriment to the soils capability of infiltrating, absorbing, and retaining moisture. tractor with ammonium tank and plow. A perfect recipe for runoff. 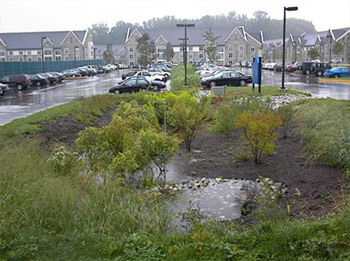 This use of chemicals combined with other poor land management techniques creates conditions for flashiness of streams and large flooding events. 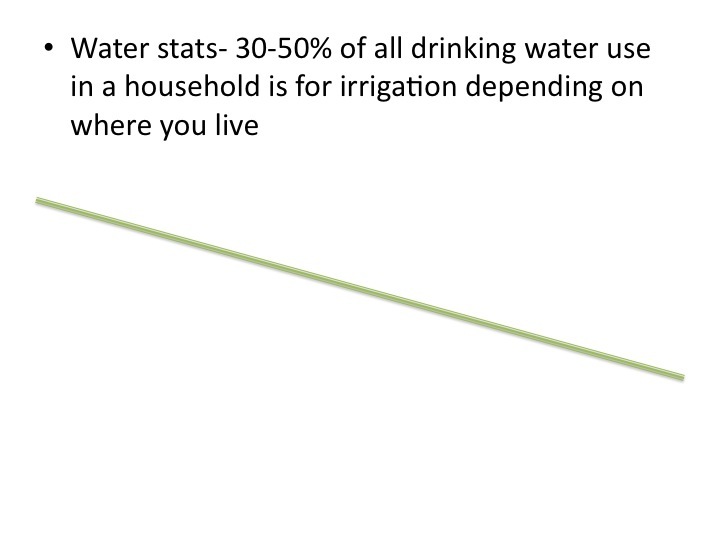 The initial figures below detail just how much how much water comes from the part of the state that is planted in corn and soy. It’s over half of what used to be a rich mosaic of prairie, savannah, and forest ecosystem (and even more now that the price of corn has skyrocketed due to ethanol demand). Hundreds of billions of gallons and into the trillions in liters of water is poised for runoff in the causal one inch of rain (25 mm) depending on the environmental conditions it encounters. In my days there in Iowa (2009-2011), I had many discussions with wildlife biologists on the local flora and fauna since this is my formal background. One particular gentlemen who came to talk to the class about local ecosystems and this topic of water runoff, stated that the prairie was able to retain three inches of rain before runoff occurred. He asserted this was because of its diversity of root systems and huge volumes of organic matter due to the buffalo herd, fire, native american interaction. This rotational grazing system employs large amounts of animal impact yet strengthens ecosystems through the rest they need after an interaction with grazing herbivores. 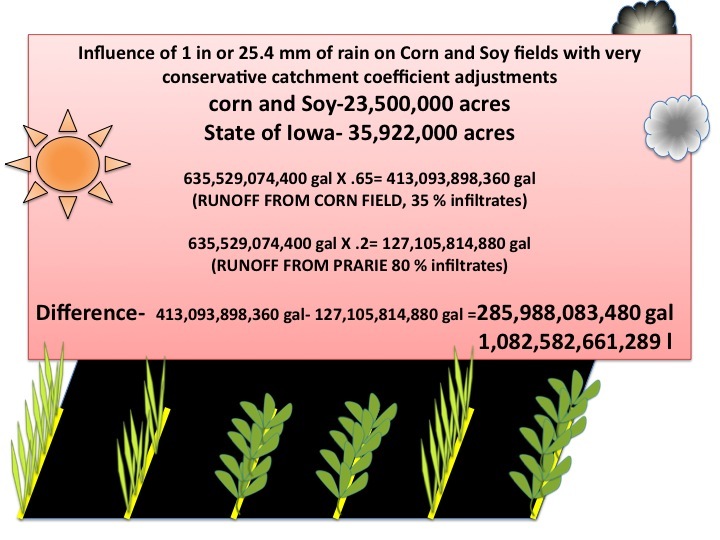 However in the calculation below I very conservatively estimated that 20% of rainfall amounts would runoff in the conservative one inch rainfall event in the prairie ecosystem. Also I very conservatively estimated that 35% of the rain would infiltrate in the corn field. Thus the catchment calculations below display that extra coefficient analogous to metal roofs shedding more than tar & gravel roofs (edge effect). The difference in the two ecosystems is staggering in terms of how much water is pulsated into streams because of this poor land management. These numbers, while extremely conservative, may indeed point that we don’t have a problem of carbon in the atmosphere but rather one in the ground as organic matter % and actual plant life. Corn fields are virtual deserts, propped up through huge subsidies, toxic chemistry and unfettered capitalistic consumer demand of cheap sugars, cheap animal products and ethanol in our fuel tanks. Our attention is diverted to carbon dioxide from coal plants meanwhile they spew out far more dangerous chemicals. It justifies nuclear which may indeed be the worst idea of humanity. 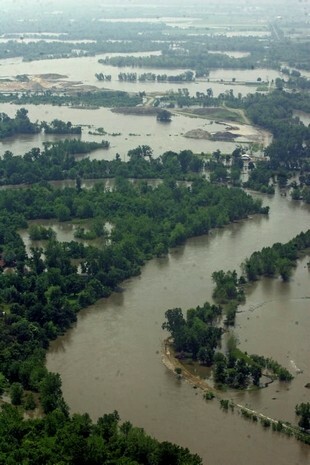 In 2008, a flood of epic proportions hit the state of Iowa after weeks of stormy weather. The costs of these floods can be measured from insurance claims, crop damage, and cities bills to rebuild infrastructure to name just a few budget lines. 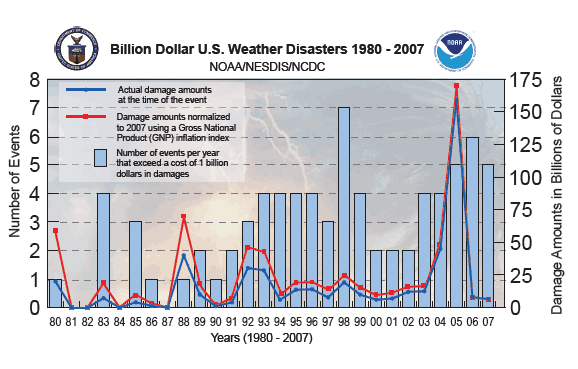 The figures hovered around the 10 billion mark but were less than the 27 billion of the 1993 flood. These are tangible costs but what about to the human psyche or community dynamics? We never really do know the true costs yet almost all creation myths include a flood. This shows historically this has always happened but simply not at the rate in which we see it these days. I pin this again to the loss of resilience in our ecosystems from creating a half hydrological cycle. These extra costs are beginning to really burden nations economies and through catastrophes even more destruction occurs as the rebuild exponentializes ecosystem decline. This figure shows the steady rate of flooding events (non Hurricane related) and their cost buildup. You know the charts magnitude because of its measurement in the billions of dollars mark. This is unsustainable and has always been my understanding of climate change that the bill to repair one day just becomes too grandiose for states or nations. The costs of basins are lower when initial systems are implemented rather than retrofits. Numbers range but internet research reveals the cost is around one USD for every cubic foot. This is an expense but not cost prohibitive. It is time for governments to regulate this development or for consumers to boycott unless something is done. It is on all of our backs to fix this. Community groups can lobby when stores are built for certain practices to be implemented rather than trying to block it entirely. Often it happens anyway and using our energy in mitigating some of the development is a good task. These basins can not only filter and infiltrate water but also provide local plant habitat and aesthetically pleasing areas. 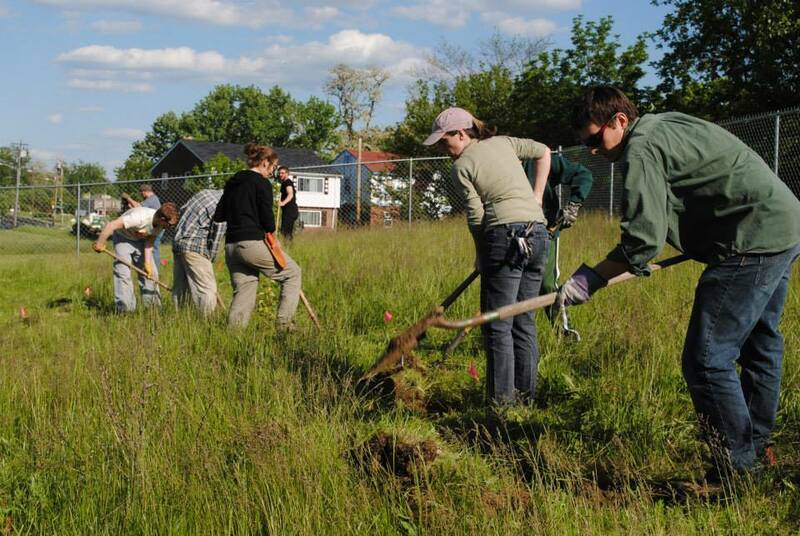 Prairie plants can even go in as these areas need to be planted with specific plants that can tolerate waterlogged and dry soils for prolonged periods. These can be apart of an ecosystems approach of diversity, edge and use of biological resources for Pest Management. 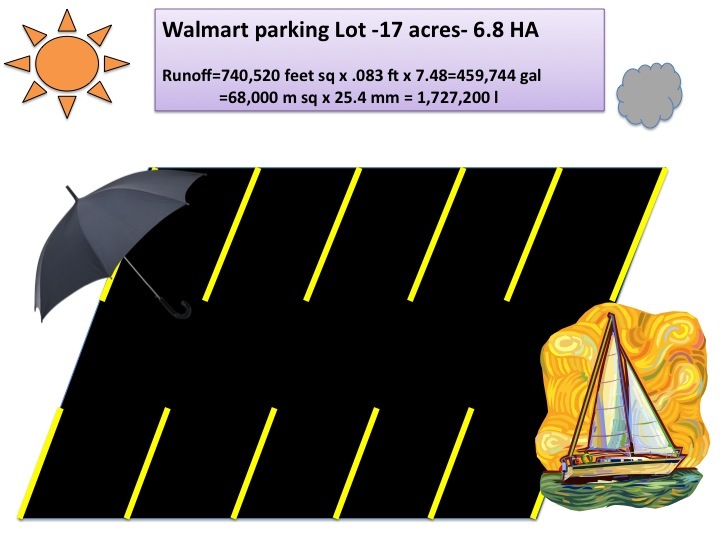 So can Wal-Mart afford to deal with all of its water coming from its impervious surfaces? 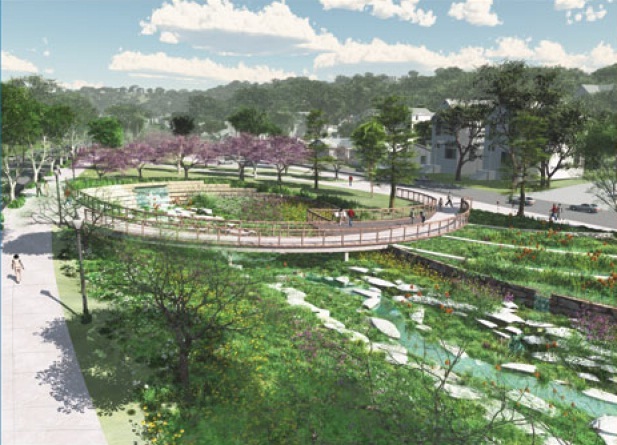 With an average cost of 18 to 80 million for each development, the company could fit the bill of buying extra land, installing the feature which shouldn’t be too costly because heavy moving equipment is present, and the landscaping contract for maintaining it. The basin is a system that takes a couple of years to mature but could be part of the green jobs sector that many nations leaders have tried to begin but were unaware how regulations could spur economy. It’s quite simple. As Bill said, “Though the problems of the world are increasingly complex, the solutions remain embarrassingly simple.” Some simple math, earth moving equipment that is already on site, a landscaping crew to finalize the hole in the ground. Doug you are brilliant! Thank you for sharing so much great content for the benefit of all. Does the “cheat sheet” info from Brad Lancaster end after the five bullet points? This info is truly fascinating and quite a lot of info to take in, so I’m going to come back to it when I’m fresh in the morning. Thank you so much for sharing these important concepts, Doug. Eh, we got something they could never take away!